Motorola's affordable flagship in the Moto G Series known as Moto G5 is now up for sale in the Europe and is available via three retailers priced at €199. Three Dutch retailers Mobiel, GSMwijzer, and Belsimpel are now selling the device SIM free and with contract. The Moto G5 and G5 plus were launched at MWC 2017 last month at Barcelona and is already up for pre-orders in Germany, launching in India on March 15 via retailer Flipkart, arriving in Russia next month and now its available in Europe. The bigger Moto G5 Plus is however not available yet in Europe and is expected to launch next month with a price tag of around €289. For US customers, the Moto G5 Plus will be available soon while the Moto G5 will not be available for sale. 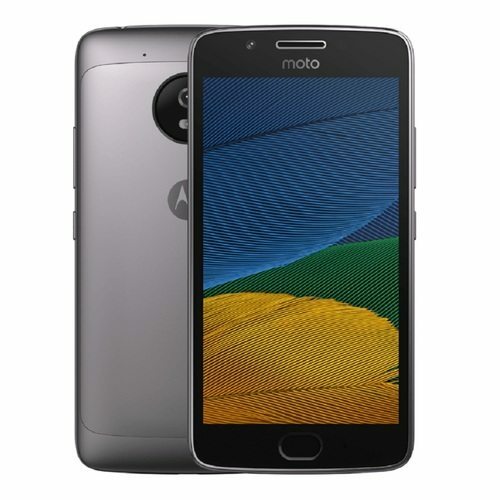 If we check the specifications of the Moto G5 again, it was launched with a 5-inch full-HD display having 1920 x 1080 pixels resolution and Corning Gorilla glass 3 protection. It is powered by a 1.4GHz octa-core 64-bit Snapdragon 430 (MSM8937) processor with Adreno 505 GPU. It has 2GB / 3GB RAM and 16GB internal storage and MicroSD card expandable storage up to 128GB. It runs on the Android 7.0 (Nougat) OS out of the box and supports Dual-SIM. It features a 13-megapixel rear camera with dual-tone LED flash, PDAF, 1080p video recording and a 5-megapxiel front-facing camera with OmniVision OV5693 sensor. It is backed up by a 2800mAh battery with 10W rapid charging and 4G VoLTE, WiFi 802.11 a/b/g/n, Bluetooth 4.2 and GPS connectivity options. It measures 144.3x73x9.5 mm weight 144.5 grams. It comes with water repellent nano-coating and front-ported loudspeaker. A fingerprint scanner is available on the physical home button. The bigger Moto G5 Plus comes with a a 5.2-inch full-HD display with 1920 x 1080 pixels resolution and Corning Gorilla glass 3 protection. It is powered by a 2GHz octa-core Snapdragon 625 processor with Adreno 506 GPU. It has 2GB/ 3GB RAM with 32GB inbuilt storage and 4GB RAM with 64GB inbuilt storage. Both comes with MicroSD card expandable storage up to 128 GB. It runs on Android 7.0 Nougat OS out of the box and we have Dual-SIM. It features a 12-megapixel rear camera with dual-tone LED flash, Dual-Pixel Autofocus, Sony IMX362 sensor, f/1.7 aperture, 4K video recording and a 5-megapixel front-facing camera with OmniVision OV5695 sensor and f/2.2 aperture. It is backed up by a 3000mAh battery with turbo charging and 4G VoLTE, WiFi 802.11 a/b/g/n (2.4 GHz + 5 GHz), Bluetooth 4.2 and GPS connectivity options. It measures 150.2x74x7.9 mm and weight 155 grams. A fingerprint scanner is available on the physical home button. It comes with water repellent nano-coating and front-ported loudspeaker. Enter your email address to subscribe to Android Crunch and receive notifications of new posts by email. At AndroidCrunch.com, we will provide you news and leaks from the smartphone world.